West Yorkshire Police is launching a recruitment drive in a bid to arrest a decline in Detective numbers. Nationally there are 5,000 qualified roles to fill, while high workloads and financial pressures mean morale in the sector is sinking. West Yorkshire Police DC and Deputy Detective Lead Ikram Ditta says a new direct entry scheme will be implemented in the force. He explained at The Police Federation National Detectives’ Forum (PFNDF): “We’re having a big drive to try and retain detectives and recruit detectives. “I’ll be undertaking a new role where I’m looking to become a Detective assessor, so I’ll be a final point on call and signing them off to say they’re competent. “We’ve got the direct entry scheme coming in now as well so that’ll be something new in West Yorkshire. 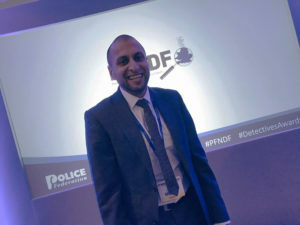 Ikram added that new plans formulated by Surrey Police Chief Constable Nick Ephgrave, which would see payments made on signing up as a Detective, completing Detective training and becoming a tutor to new recruits would be something he would ‘take back for discussion’ with senior officers.